R.MvaI is a Type II restriction enzyme (REase), which specifically recognizes the pentanucleotide DNA sequence 5'-CC(A or T)GG-3'. It belongs to a family of enzymes, which recognize related sequences. Characterization of sequence-structure-function relationships in this family would facilitate understanding of evolution of sequence specificity among REases and could aid in engineering of enzymes with new specificities. However, at the date of our analysis, no structural information was available for any enzyme of this family. Thus we constructed a structural model of R.MvaI in complex with DNA and used it to identify amino acid residues involved in specific DNA recognition – in particular those, which may be responsible for different specificity of R.MvaI homologs that recognize different sequences. Shortly after the acceptance of the final version of our manuscript , the crystal structure of R.MvaI was published  giving a possibility for direct comparison of our model with the native structure. Our modeling appeared to be fairly successful. Our model correctly predicts all the key features of MvaI: its monomeric structure, the PD-(D/E)XK fold, relationship to MutH, all catalytic residues and several DNA contacting residues. 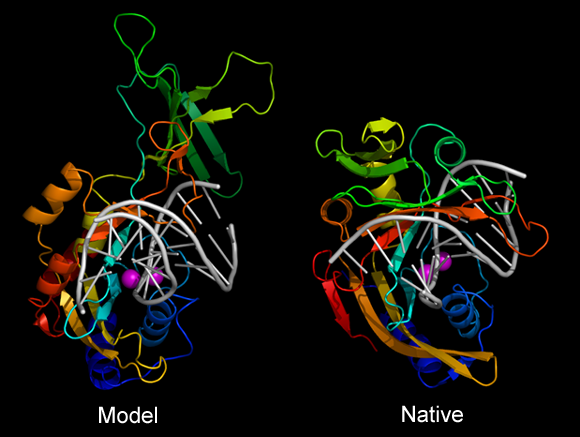 Comparison of structures of our model and the native structure (PDB code: 2oaa).Structures are colored according to the sequence index (N-terminus – blue, C-terminus – red). We correctly predicted that R.MvaI exhibits the PD-(D/E)XK fold and that it binds and cleaves DNA as a monomer. The model is of good quality in regions responsible for catalysis and main DNA contacts. A part of the model (greenish region) was not modeled correctly. 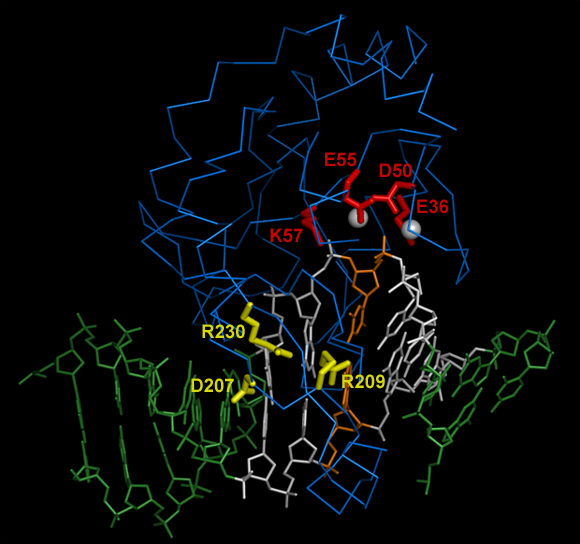 Correctly predicted functionally important residues of R.MvaI-DNA recognition.We predicted all catalytic residues (red sticks) and several DNA contacting residues (yellow sticks) including D207, R230 and R209 and that R209 residue is involved in the recognition of the central base pair.